I picked up most of the six book series called 'Resistance'. This is a World War II series of action novels written in the early 80s by Gregory St. Germain. I'm not terribly certain if this is a house author and few details are out there about him or this series in general. This first 'Resistance' entry is called "Night And Fog". It was released in 1982 under the Signet brand and part of their "Signet Action Adventure" marketing. If you look closely at the book cover you will see that the illustration is inside the picture of a phoenix. All of the 'Resistance' titles are adorned that way and I thought it was fitting considering this is a team based book about a unit called Phoenix. "Night And Fog" is set in the early stages of World War II. From just my history buff experience, I am thinking this would have taken place around late 1939 or early 1940. Poland has just been invaded by Germany and some of the country has been given to Russia. Our main character is an action guy named Scott Gideon. He is an American who has been quite the journeyman for the last decade or so. He recently left war in Spain and is recruited in Belgium by a millionaire named Philaix. Gideon survives a trial to determine his worthiness and soon Philaix employs him to lead a ragtag bunch of mercenaries into guerilla warfare against the Nazis. His first mission is to infiltrate a German occupied castle in Poland and rescue a Polish general. His team consists of seven war vets from places like France, Russia, Holland, Ireland, Poland, Austria and Italy. Each of these guys are recruited based on their expertise with knives, maps, boats, explosives, etc. St. Germain's writing is somewhat technical at times. I found it hard to follow his geography, often confusing in its details of where the team is in relation to various German camps, Belgium, Poland and Russia. The whole book is basically about the team's mission to Poland and the eventual retrieval of the general. Throughout this long road trip they find themselves in various battles and extreme circumstances. The group fight patrols out in the fields, they destroy various checkpoints, airports and eventually infiltrate the castle. Once inside they become captured and then escape in one of the more ridiculous "heroic" scenes. The end of the book is a furious round of gunfire as German troops chase the Phoenix team down a runway. This is a really decent historical overlook at some of the early trials and tribulations facing Poland in the preliminary stages of the war. The plight of the Polish people is brutally told in a no-holds barred narrative. This part of the book was fairly educational to me. I found the daring rescue and firefights interesting early on and by book's end, I began to tire of the endless firefights. The plausibility is completely thrown out the window and rightfully so considering this sort of action adventure tale. I was surprised to see one of the team members killed off and the aftermath of that tragedy. The human nature of the book is well done and the cohesive fighting unit comes into its own in a way that makes you want to seek out more volumes. I'm gonna give this one a recommendation and is one of the few World War II action novels I've ran into. 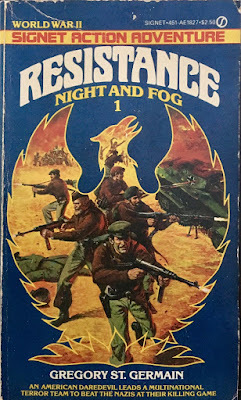 Comparing to films I think "Night And Fog" is similar to team based vehicles like 'Dirty Dozen' and 'The Wild Geese'. I have the whole book series now so look for more of my 'Resistance' reviews in the future. Hey I just commented on your Tumblr about Glorious Trash but I see you have it here on your blogroll so nevermind. Thanks Jason L. I appreciate it.